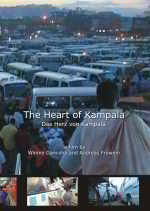 "The Heart of Kampala" . Your purchase of a DVD will help us to replace the costs of this fully self-financed film and also enable us to continue producing films about African day-to-day life. Our aim is to show the other side of African life to enable people have a better understanding of our neighbouring continent, which is mostly presented in clichés of hunger, war and Aids. Combination version of English + German on one DVD for 17.00*) Euro (22.00 US$). Within Germany 2.20 Euro, within Europe 6.00 Euro, outside Europe on inquiry. If you would like to buy a DVD, please send us an e-mail with your postal adress and your selection. You will then receive an invoice with the amount including V.A.T as a PDF-file. When the due amount arrives on our account, the DVD will be sent immediately.. If you transfer the money from outside Europe, our bank shall unfortunately charge 5.00 Euro if the currency is in Euros and 7.50 Euro if the currency has to be exchanged. For this reason, you can opt to send the money in a letter, but unfortunately at your risk. Please remember that the DVD is only meant for personal use. If you intend to use the film for commercial purposes or non-commercial purposes like education please inquire with us. Order at : info@andreas-frowein.de or by fax. *) If you would like to further support our work, please feel free to pay a higher price for the DVD.